To check our actual offers in Karlovy Vary, please use the white form above. Just enter the desired dates, time and pick-up/return location. The most recent car booking in Karlovy Vary has been made on our website 1449 minutes ago.. In Karlovy Vary, we offer for rental 6+ car categories from 8+ rental suppliers. Low prices. OrangeSmile.com offers car reservation service in Karlovy Vary on the best-rate-guarantee basis, since we work with car suppliers directly. For your dates in Karlovy Vary, we select and present the best ever possible rental offers. Our car rental process contains 3 simple steps: (1) search for available cars for your dates in Karlovy Vary; (2) select your car type; and (3) fill in the booking forms. When your booking in Czechia is completed, you will receive our confirmation voucher to your email address. Your reservation in Karlovy Vary should be confirmed by a valid credit card. During the booking process, please check your rental conditions. To pick up your car at the rental point in Karlovy Vary, you need to provide our confirmation voucher, your driving license and a valid credit card. A credit card is necessary for a deposit. In Czechia, the deposit amount depends on the age of the driver and a type of the rented vehicle. The final payment in Karlovy Vary is normally performed at the pick-up point. Our car hire points in Czechia accept VISA, MasterCard, etc - please check your rental conditions. At the pick-up point in Karlovy Vary, please read the handling manual and check the car for present defects. In case, if some defects are not mentioned in the rental documents, please report back the rental office. 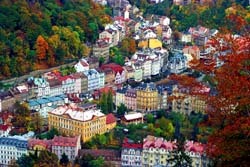 OrangeSmile.com wishes you a pleasant journey to Karlovy Vary! Karlovy Vary is famous for its spa complexes, many of which started serving visitors in the beginning of the 20th century. Lazne is considered the oldest health center of the resort. The center offers a lot of services and treatments for pleasant and comfortable stay. In Lazne visitors will find various massage and beauty halls, a salt cave, mineral water pools and whirlpool, gym and areas for gymnastics, and even special pools and recreation areas for children. Not long ago a spa was opened in the territory of the health center. It will certainly please devotees of relaxation and beauty treatments. The thermal pool is a real tourist attraction. Fans of swimming can attend it even in winter. The temperature of water in the pool never falls below 30 degrees by Celsius, and the length of lanes is 50 meters. In Karlovy Vary tourists will find a lot of bars and night clubs that suit every taste. Music lovers, fans of dancing, and tourists who want to spend free time in relaxed and intimate setting will easily find a nice place to stay and have fun. Becher's is a stylish nightclub attracts visitors with fiery parties and live music every day. The club’s bar serves delicious cocktails and Czech wine. Fans of jazz will definitely enjoy their visit to Club Imperial. Several times a week the club hosts interesting theme nights and performances by contemporary jazz bands. Club Imperial also has a great bar and a comfortable lounge perfect for relaxation.